PETALUMA, Calif.--(BUSINESS WIRE)-- Hydrofarm Holdings Group, Inc., a leading independent wholesaler and manufacturer of hydroponics equipment and commercial horticultural products, today announced a strategic partnership with Argus Control Systems Ltd. to provide advanced environmental systems and services for horticultural production in the United States and Canada. Building on over thirty years of leadership in control technology for plant growth facilities, Argus continues to develop innovative solutions for clients in commercial horticulture, biotechnology, and plant science research around the world. 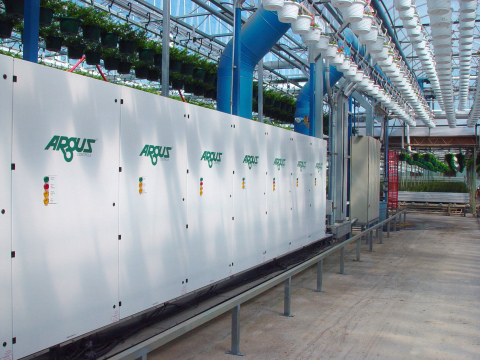 Argus provides advanced environmental control systems that are customized to each grower’s requirements and are adaptable to their changing needs, enabling them to operate their facilities exactly the way they want. Combining a thorough understanding of greenhouse and indoor growing environments with unique technology for irrigation control and nutrient management, Argus provides a complete controls solution for a full range of horticultural facilities. “Argus and Hydrofarm are aligned in our deep horticultural history and passion for technological advancement. Our mission is to provide the best horticultural automation systems with best in class results. Together with Argus, we are able to provide clients with a customized controls solution that will enable them to achieve their goals,” said Hydrofarm CEO Peter Wardenburg. “We know firsthand that automation and environmental control are complex issues so we work closely with every client to understand their needs before designing a solution. The result is a robust, plant-centric control system that is easy to use while providing the flexibility to expand and modify as their requirements change,” Heaven added. High-growth and increased needs for services are anticipated within the industry this year. Argus and Hydrofarm have strategically aligned to meet the needs of this challenging growth. About Argus Control Systems Ltd. Source: Hydrofarm Holdings Group, Inc.